Ever since Facebook changed the rules of brands engaging on the platform "to improve the user experience" brands – big and small across the world – are facing substantial declines in organic reach. It's simple. Facebook wants brands to put their money where their social mouth is. The decline is around 50% of what it used to be. That's a lot. A study from Ogilvy (done a few useful months after the October 2013 change) shows that for larger brands with over 500k Likes, the decline is down to around 2% of all reach for February 2014. These large on-Facebook brands were pulling in above 4% before the platform made changes. So, the newsfeed algorithm change sends a clear message to brands on Facebook – start to pay for engagement and reach. The changes don't target large Like or fan based brands alone. 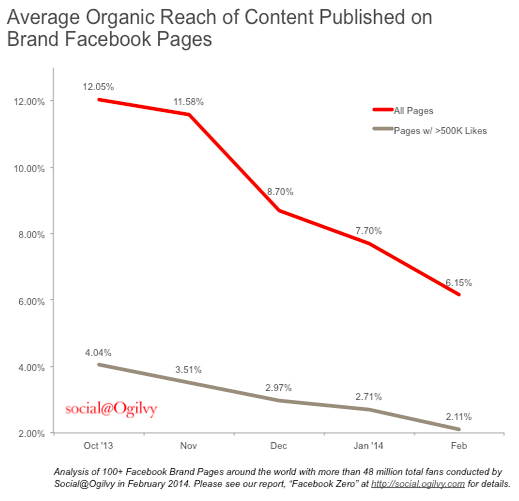 The organic reach decline is across both large and small fan based brands. So, Facebook's message about "improving user experience overall" is size neutral. A company called Sim Partners who provide social marketing solutions saw this affect them hugely. The extent of the decline prompted them to protest. "“We used Facebook advertising to help promote our page and content, but when we turned the ad campaign off, we saw a significant decrease in organic traffic to our page,” says Hawkinson, a partner at the company. “A small drop in organic traffic was expected with the loss of the ad promotions, but we experienced drops between 69% and 83%, numbers which are astounding.” a spokesman said on mashable. Ogilvy Social feel that organic reach still has its place on Facebook, but feel that it will be around and keep its place for a "few months to a year". This is not going to drive brands away from Facebook, but simply up the ante on increasing their media spends on the platform. Most brands engaging on Facebook here in the region provide very little media (spend) support on Facebook. They're going to have to come to the table with fatter wallets now. Not sure they'll "Like" that. These are awesome tips to shine in digital marketing…Thanks for sharing your knowledge with us. These strategies help us lot to create better marketing on digital marketing and enlarges our network. I really appreciate your article…keep posting!! !